*Make sure to grate the onion with a cheese grater, the smaller the better. Remove any excess water before adding to meat mixture. Mix all ingredients in a large bowl and cover with saran wrap or airtight lid. Refrigerate at least 2 hours, or overnight. Remove from the refrigerator. While still cold, scoop a large handful of the meat mixture and roll into a ball. Push a metal skewer through the ball and use your hands to shape the meat into a long rectangle. You can use a finger to make evenly space indentations along the meat (as in the photo above). This not only adds visual appeal it also allows the meat to cook more evenly in the center. Grill the kabobs on high heat or open flame about 4-6 minutes each side, until meat is no longer pink inside. Sprinkle with sumac spice before serving. You can substitute ground chicken for beef or lamb. Add 1 Tablespoon fresh lemon juice to the meat mixture before grilling. Follow the recipe as indicated above. Save the juice! 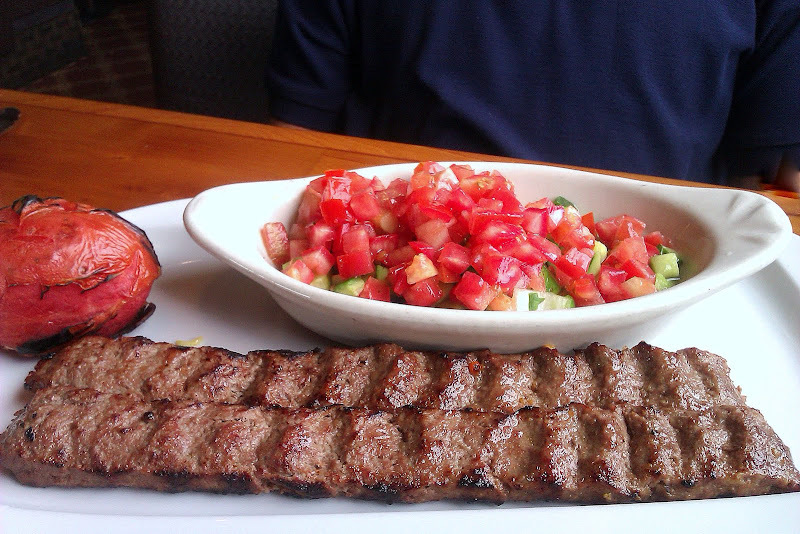 When removing cooked kabob from the grill, place on top of a piece of pita bread or lavash bread. Let the bread soak up the juice. This is my dad’s favorite part of the meal! one of my favorites I haven’t made in so very long!! !